As an On Purpose Associate, assigned to APP on a short-term work placement, I was excited. I had been matched with a purpose-driven organisation, one which was a dynamic mix of brave and humane. Brave enough to tackle injustice from the bottom-up and humane enough to not dismiss anyone as beyond hope, change or second chances. Since joining APP in April, I have mainly worked on two key initiatives. The first project has been to develop indicators that can be reported to management and external stakeholders to demonstrate APP’s reach and impact. The second has been researching/undertaking planning for the establishment of a prison-based law college, a pioneering vision from our founder. Early on, I knew the risk to not achieving any type of success in my work, was sitting stagnate in Mitcham, hunched over a laptop. A visit to both Kenya and Uganda felt necessary, to make a human connection and to apply real-world context to what I was doing. There were many highlights to my one-month round trip, professionally and personally, including experiencing the warmth of APP staff, prison staff and inmates. I learned a great deal, finding clarity from exchanges within APP offices and prisons. Whilst in Uganda, it was easy to be impressed by the human rights model for legal assistance, a programme that runs concurrently to the more highly-profiled University of London Bachelor of Laws training. 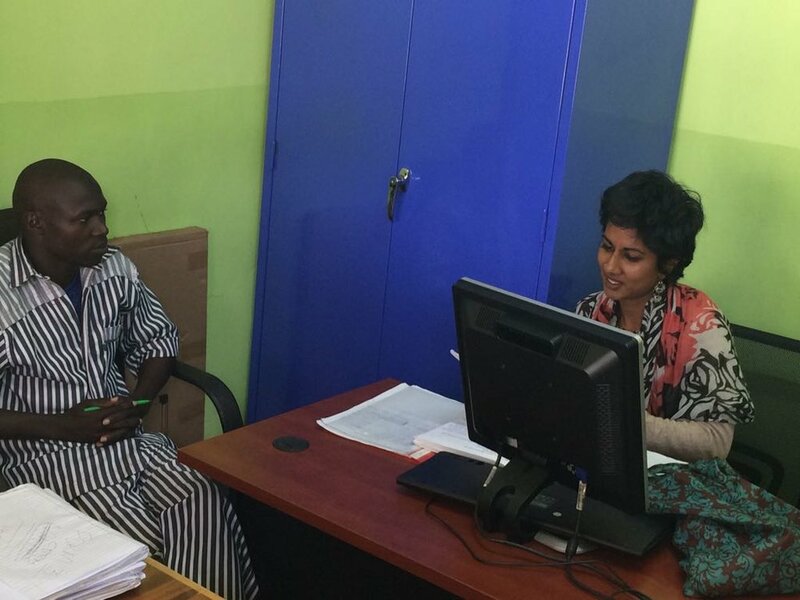 For this programme, selected prison staff and prisoners are trained to deliver legal awareness-raising sessions to the wider prison community, and to offer basic, legal assistance to pretrial detainees/the remand population. It was astounding to know that legal empowerment at a very fundamental level could be life-changing. For example, prisoners who are serving (seemingly) indefinite time in remand, are made aware of their right to bail and are assisted in making bail applications to the court and having sureties traced. They could then be released on bail, enabling them to re-connect with their loved ones, contribute to their family's welfare and have the extra capacity to prepare for their trial. The far-reaching impact? Prisons, governments and wider society benefiting from the decongestion of their severely over-capacitated remand prisons. As obvious as it may sound, I found it important to be cognisant of the fact that those in remand have not been convicted. They have rights that should be upheld. And it would be amiss to assume that remandees had found themselves detained due to an unequivocal and just judicial process. It was almost unbelievable to hear of the many that had not seen a lawyer or were unclear as to why they were in prison. I, therefore, admired the deconstruction of the issues by APP (ie. breach of human/legal rights, a lack of access to (quality) legal advice, prison congestion) and how programmatic ideals of low cost, wide reach and high impact were actually being achieved. My time in Kenya was also incredibly informative and personally impactful. Highlights included a visit to Naivasha prison, and being able to see the space that had been identified by the prison services for the construction of learning amenities for APP’s work. I was also able to sit-in on an awareness-raising session led by APP-trained ‘paralegals’ at Langata women’s prison, followed by a moot-court session. I was so impressed by the confidence and conviction of the female inmates as they led the training, as well as how composed the ladies were when they presented their arguments in the moot court. It was surprising to be told by Carol, the APP legal aid officer, that there was a time not so long ago, that these very women were much more introverted, reluctant to speak so publically. In those few hours, I believed I had really witnessed the empowerment component of rehabilitation, and although I had played no part in their journey, I immediately felt proud of their achievements against the odds. I have now returned to the UK, back to my desk and laptop. However, there is a change in me. I am feeling rejuvenated and refocused, a direct result of the inspiring individuals I met and the experiences I shared with others. I now know it is time to demonstrate my ‘on purpose’ value. I deeply hope my new-found insight can translate into a valuable service for the organisation and the wider prison community in the short time I have left with APP.